Efforts by Burundi to remain in a non-recognition position against the new Speaker for the East African Legislative Assembly (EALA) have been thwarted by the regional court. The First Instance Division resumed its March sessions and struck out the Application filed by the Republic of Burundi, seeking Court’s order to stay recognition of the Speaker of the East African Legislative Assembly (EALA). The Court in its Ruling said that the Application has been overtaken by events and that the real dispute will be conversed in the substantive Reference. 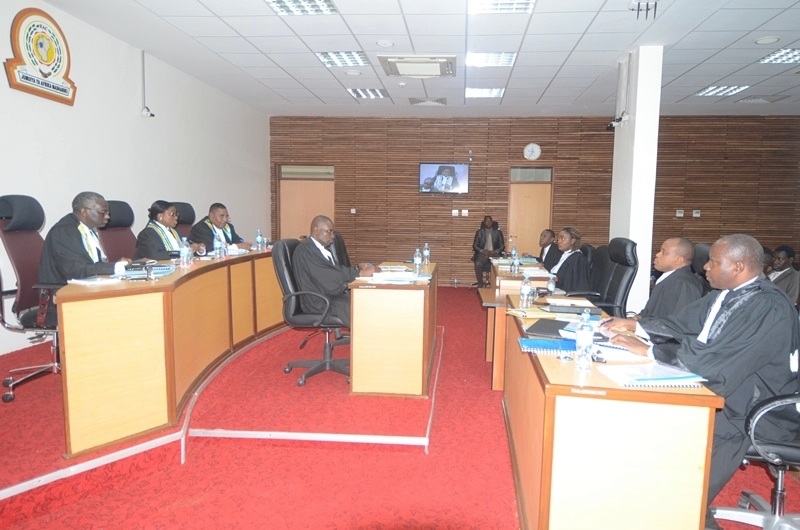 The Court added that though Counsel for the Applicant (Burundi) did understand that an order for none recognition of the Speaker entail suspension of the Assembly, that it was neither argued nor the Assembly was an issue in the matter, that it is the view of the Court that the office of the Speaker is the issue in the Application and that the holder thereof has since duly commenced his functions. In robe Martin Ngoga is joined by legislators after he was elected Speaker of the East African Legislative Assembly (EALA). The Court therefore struck out the Application and ordered that the Reference (main case) challenging the entire elections process of Speaker of the Assembly be heard expeditiously. Before the ruling was delivered, Court also had disallowed the Application filed by Hon. Mukasa Fred Mbidde, seeking to amend his application to join the matter as an intervener opposing the Applicant instead of joining as amicus curiae (friend of the Court). Hon .Mbidde before had applied to join the matter an amicus curiae, however he was changing the position from amicus curiae to intervener because he has interest in case him being an EALA Member which the Court declined to allow and he later withdrew because he would not proceed without amendments. This case is the 1st one being filed by a Partner State against the Community, under Article 28 which provides mandate to Partner States to file a case to Court. All the cases the Court has handled are matters brought by Individuals or None Governmental Organizations (NGOs) or the Bar Associations under Article 30 of the Treaty (Natural or Legal person). The Republic of Burundi in the Reference is challenging the election of the Speaker of EALA, arguing that, the Assembly did not follow Rule 12 of the Rules of Procedure of the Assembly, which requires the quorum of one third (1/3) of the elected Members from each Partner State, yet Burundi and the United Republic of Tanzania did not participate in the elections. Burundi is therefore asking court to declare that the election violated rule 12 (1) of EALA Rules of Procedure and order for re-election of the Speaker in accordance with the Rules of procedure. The matter was brought before Honorable Judges Lady Justice Monica Mugenyi (Principal Judge), Justice Isaac Lenaola (Deputy Principal Judge), and Justice Fakihi A .Jundu.